Lotus engines based on pedestrian Fords and Vauxhalls with buzzy four-cylinder exhaust notes may have worked for a Lotus Elan or Jensen Healey, but they always sold the gorgeous Lotus Esprit short. This changed when Lotus introduced its first V8 in 1996. The original Esprit, cloaked in Giugiaro's paper-fold wedge from the same era as his first VW Golf, replaced the Europa in 1976. Its British Leyland body hardware was a jarring reminder of Lotus's kit car past, but as successive GM and Toyota involvement purged the Esprit of many of its low-rent components, Peter Stevens (of McLaren F1 fame) undertook a Golf II-style smoothing of the Giugiaro wedge's edges while he was moonlighting for HSV. 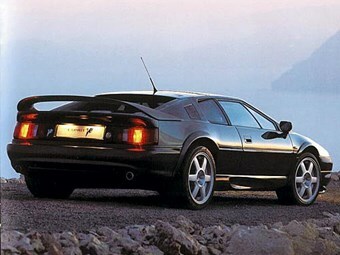 His 1987 revamp of the Esprit's proportions was accompanied by a welcome boost in strength. It was then tweaked in 1993 by Julian Thomson, who left it looking like he had too much time and plasticine on his hands. Yet it kept the Esprit alive - in an era of ever-changing ownership - long enough to become the beneficiary of a cancelled Lotus V8 from another program on its 20th birthday. Sold in Australia from day one, this magnificent engine, with twin Garrett turbos contributing to a beefy 260kW/400Nm from just 3.5 litres, transformed the 1380kg Esprit into a supercar. Power was actually wound back from the race version to protect the Renault transaxle. A top speed of 283km/h and a 0-100km/h time of 4.5 seconds allowed the Esprit to be considered in the same breath as a Ferrari at a fraction of the price. The V8 cabin was spruced up, the ABS upgraded, and the exterior spared more go-faster tweaks save for a larger air intake, modest front aero winglets, dual exhausts and subtle badging. Apart from early concerns over cylinder-liner seals, the new V8 was relatively reliable and inexpensive compared to costly failures experienced by Ferrari F355 owners. But don't expect a V8 rumble. A flat-plane crankshaft gives more of an F1-quality at idle and high engine speeds. Even better, the amazing grip and driver involvement that made the original Esprit so beguiling, survives. Stealth body height and poor rear vision make driving one in today's world of giant SUVs a challenge, but it's one to savour in the right context. The Esprit V8 underwent a final freshen up in 2002, linking it to the Elise before production ended in '04, though most Australian cars are from the early series. Highly prized, they should be worth every cent of the $55-75,000 it can take to prise one your way. An all-new Esprit is due in 2013. A rare refinement of an eye-catching classic surfaces in sunny Queensland.